Need a New Roof in the Denver Area? Strait Line Roofing is a Littleton roofing contractor. We are an established local roofing company, specializing in residential roofing, roofs for new construction, and commercial roofing for homeowners and businesses in Highlands Ranch, Lakewood, Arvada,Westminster, Aurora, Golden, Littleton, Jefferson County and Douglas County. We are a Colorado roofing company with over 18 years of experience. We have built our reputation on our superior workmanship, exceptional customer service, quality materials, expertise and our hometown presence. At Strait Line Roofing Services, we run small, experienced, highly-trained roofing crews. Either the company owner or your foreman is on the roofing job site every day inspecting the work to be sure it meets the highest standards. We are roofers who do the work right. As a matter of course, we replace all flashing and jacks. We can install seamless gutters. We do waterproofing. We understand your roof and your location. For example, we know how the building codes in unincorporated Jefferson County may differ from those in Golden. I can’t begin to say enough about Straight Line Roofing and their quality of workmanship, and attention to detail! Even the County Inspectors were impressed with their workmanship. What surprised me the most was that we received over 16 complements and inquiries from neighbors that live in our 500-home neighborhood. One of the most important aspects to us was the consultative way in which Doug assisted us in making our selection, and further recommending additional venting needs to extend the life of the roof. We have seen SIGNIFICANT reduction in our energy bills. Additionally, replacing a roof can be very messy. When the job was completed, you couldn’t even tell that his crew had even been there. I can’t recommend a better company for your roofing needs. Strait Line Roofing performed a roof inspection, quote for repairs and quote for a 5-year roof certification for our house with a concrete tile roof. They had the most conservative and reasonable approach to our roof maintenance. We’ve since had a roof leak resulting from heavy rain/snow, and they repaired it at no additional cost. Strait Line Roofing came to my residence after the recent hail storm and did a complete roofing evaluation. After Doug checked the roof for damage, he assured me that there was no immediate need for repairs, but told me my house would need a new roof. He advised me to contact my insurance company. I contacted the insurance and scheduled the appointment through Strait Line Roofing. Doug met the adjuster and handled the entire claim from start to finish. The crew that worked on my house was extremely tidy and cleaned up often with one final sweep of all debris at day’s end. I had several out of state companies tell me it was extremely urgent to get a new roof. They tried to get me to sign a contract and give them money down. Strait Line Roofing never asked for any money until the job was 100% complete. My wife and I were happy. I have referred them to numerous neighbors and clients and they are all as happy as we are. They are an exceptional example of how a roofing business should be run. After the recent high winds in the Highlands Ranch area, I found several pieces of my asphalt roof in my front and back yard. My neighbor suggested that I call Strait Line Roofing, which had installed his new roof. They responded the next day and gave me a very reasonable quote for repairing my roof. They even did minor repairs on the spot to keep out moisture until they could return. The repairs are perfect and I cannot even tell where the previous damage was. When it comes time for a new roof, they will be my only call. I just wanted to thank you and your crews for the incredible job on my roof. The roof looks amazing and completely enhances the house. I know that it was a tough job with a very difficult patterned type of shingle from Canada, but it was well worth it. Your crews did a great job throughout the process from tear off to final clean up. I know that several of the neighbors have hired you after seeing our roof. I will continue to recommend you and your company to all of my friends and associates for your professionalism, expertise, quality and pricing. We just had to write you a letter of thanks for the most excellent experience we had working with your company on a new roof for our home. We have had numerous dealings with other various contractors over the years, which make us all the more appreciative of the level of communication from you, your follow through, starting the project when you said you would start, and completing it on schedule. Your employees not only did excellent work, but cleaned up the area daily before departing. When the county building inspector completed the final inspection, he commented that your company did a very good roofing job which made his job easy. Doesn’t get any better than that. We absolutely would recommend Strait Line to anyone looking for a great roof at a fair price done the right way. We provide free estimates and free inspections. We provide emergency roofing repair services. We are responsive and reliable. Call 720.331.1803 any time, day or night. If we can’t take your call right away, we’ll call back — pronto. We handle everything for your roof replacement from securing the permit to prep to cleanup. At the end of each day, we leave your home or business clean and attractive. We work with all insurance companies and we can handle your insurance claim. All roofing work is guaranteed. We are certified to install beautiful, high quality roofs manufactured by GAF, Owens Corning, Tamko, CertainTeed and other top manufacturers. We work closely with our suppliers: Gulf Eagle Supply and American Roofing Supply. Strait Line Roofing has an ongoing relationship with the two largest Colorado supply company’s Gulf Eagle Supply and American Roofing Supply. We use only the best materials on your project, starting with the felt, Ice and water shield to the shingles. We use only the best materials I.E. Grace, G.A.F. Owens Corning, Tamko, Monier or Westile, Just to name a few, If you are looking for a 3-tab or a lifetime Designer all the way up to a tile or slate roof we can take care of all your needs. 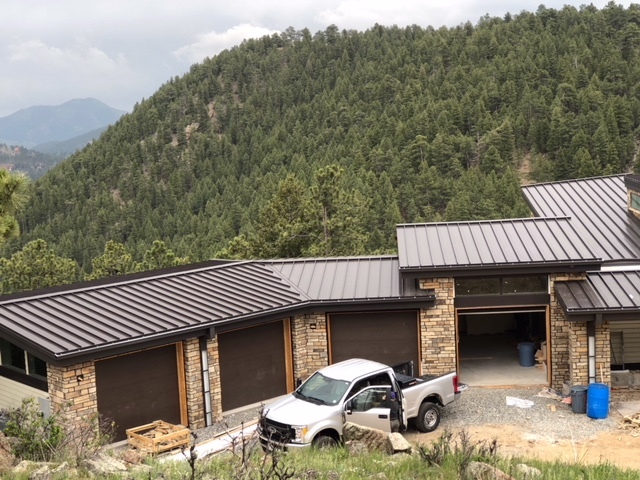 Strait Line Roofing owner Doug Gray grew up in Lakewood, Colorado and now lives in Littleton. His business has grown based on referrals from satisfied customers. Whenever there is a hail storm or high winds, many roofing contractors flood into Colorado from out of state. The foot traffic inevitable with these large crews can damage your new roof. These roofing companies disappear when the work drops off. Doug and his employees at Strait Line Roofing care about Colorado. We’re your neighbors and we’ll be here long after the others have gone. Doug Gray and his employees at Strait Line Roofing Services care about your Colorado roof. We’re your neighbors and we’ll be here long after the others have gone. Call Strait Line Roofing today to get started with your new roof, roof repairs, or other roof maintanence needs.